Association of Nepalis in the Americas (ANA) Texas Chapter is organizing a live concert featuring Prashant Tamang and Amit Paul, the winners of Indian Idol season 3. The event is scheduled for Friday, August 24, 2012 at DFW Airport Hotel in Irving, Texas. 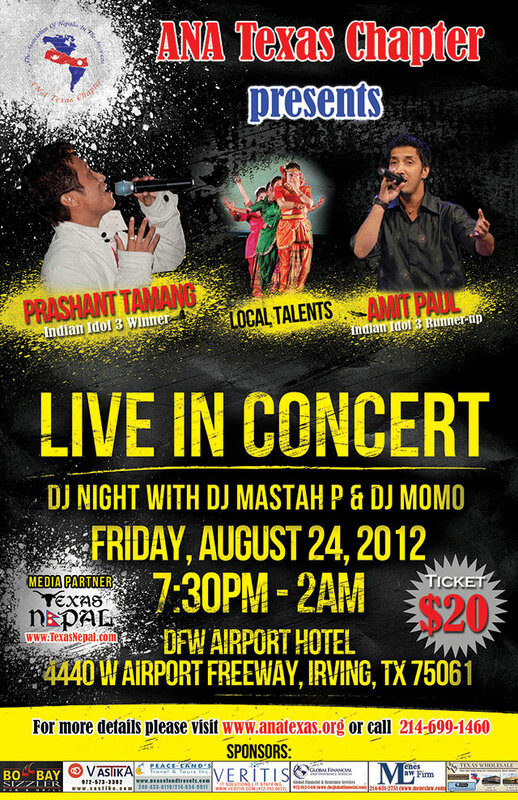 Besides the popular singers the event will have performances by talented Nepali artists from DFW Metroplex. There will be DJ Night following the concert with DFW’s popular Nepali DJs: DJ Mastah P and DJ MOMO.